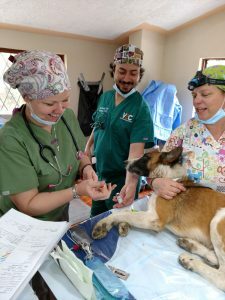 While vacationing at Rachel and Nancy’s home in Mojanda, Azadeh Chegini, a Zoetis Pharmaceutical rep in the Virginia area, was inspired to start a program to help the street dogs. 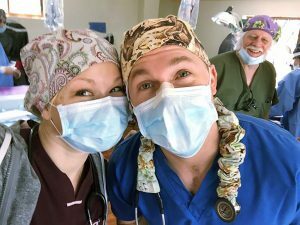 She assembled the first team of US veterinary professionals including vets and techs and Dogs of Otavalo was born. 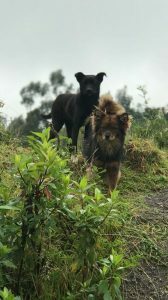 After the success of this first trip, Rachel and Nancy decided to form a nonprofit foundation eagleYcondor to continue and expand this much needed work in Otavalo. Otavalo is an Andean town known for its vibrant craft markets, nestled between two volcanos in the Andean Highlands. Cobblestone roads traverse the hilly countryside flanked by stone houses and farms. Chickens, pigs and cattle dot the landscape. Dogs are abundant. Many of them live with very poor families, mainly farmers who feed and shelter them, but many are homeless. As is true in many underdeveloped countries, street dogs are abundant and only the smartest survive. 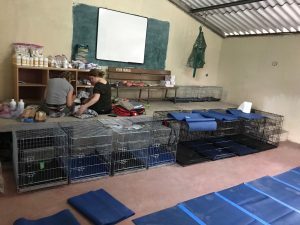 Work began in the US to bring a team to help the dogs in Otavalo. Alliances were formed with several veterinary foundations to raise money for supplies. Volunteers were recruited and a plan was formulated to turn this project into a reality. The outpouring of support was amazing. A fund was set up for donations and the volunteer team began reaching out to their friends, colleagues and industry for donations of money and supplies. Simultaneously, in Otavalo, Nancy and Rachel along with a number of volunteers began to set up the project there. No small task, this involved the work of the local government, veterinarians, innkeepers, cooks and project volunteers. After many meetings, a building was secured, permits obtained and arrangements were made to house, feed and transport the American volunteers when they arrived. The local community gathered together and were told about the project. There was a talk given about the importance of spay/neutering and vaccinating pets. Appointments were made for over 200 local dogs and cats to be cared for during the project, in addition to rounding up the street dogs. 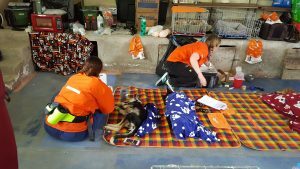 The goal was set to provide quality care to at least 300 dogs and cats over 6 days. Physical exams, spay/neuter, deworming and vaccinations topped the list. Volunteers would need to carry over 3000 lbs. of supplies and equipment from the United States in checked luggage. Next, we were tasked with turning an old concrete community center building into a fully functioning animal hospital. One of the objectives was to start building relationships with the communities of Otavalo and neighboring Cotacachi, so that ongoing care as well as basic client education could be established. 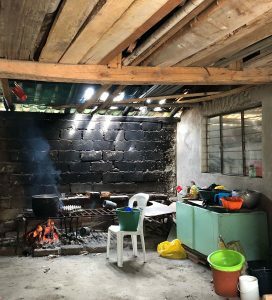 The volunteer group was welcomed with open arms by residents of Otavalo who scrubbed the building, helped translate, cooked traditional Ecuadorian food for lunch each day and watched over the supplies at night. For part of each day, the team focused on altering the street dogs that were rounded up and brought in by the fearless and dedicated volunteers of Patrulla Amigo Fiel, or Faithful Friend Patrol. 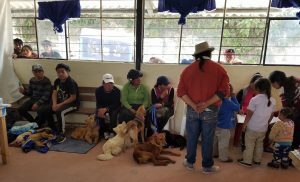 This group rescues sick, injured and hungry street dogs in Otavalo, Ecuador. There was concern that the street dogs would be difficult to work with but the opposite was true; the street dogs were the easiest group to work with and responded well to affection. 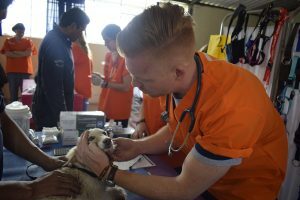 After 6 long days, a group of 30 veterinary professionals had spayed and neutered nearly 300 dogs and 10 cats and made a step towards controlling the street dog population in these municipalities. (see inset on impact). They also impacted the communities they touched, received so much in return and made friendships that will last a lifetime. 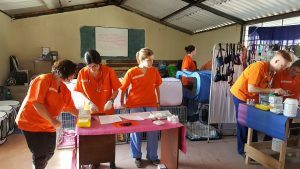 Our second veterinary project utilized 28 volunteers who worked for 5 days in Mojanda as well as in Cotacachi. 255 dogs and 12 cats were treated during the week. Most were spayed or neutered and all were vaccinated and treated for parasites. The community response was excellent. 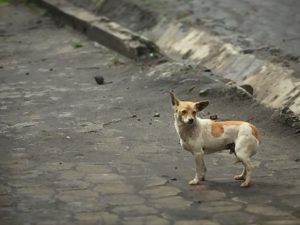 A real difference could already be felt in the population of dogs roaming the streets of Mojanda after the first trip. We improved our pain management protocol by adding the new local anesthetic agent, Nocita® which was generously donated by Aratana. Everyone felt it was extremely effective especially in the recovery area. Again we were treated to wonderful food and accommodations at Casa Mojanda which our new volunteers enjoyed as much as our returnees. We even got to do some sightseeing. Plans are underway for the 2019 spay/neuter project. 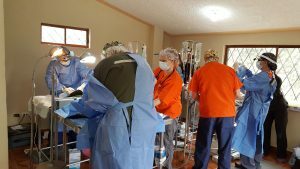 One of the goals of the Dogs of Otavalo project is to utilize the highest standard of anesthesia and analgesia despite challenging conditions. Quality anesthesia and pain management protocols were designed by three International Veterinary Academy of Pain Management (IVAPM) board member volunteers. 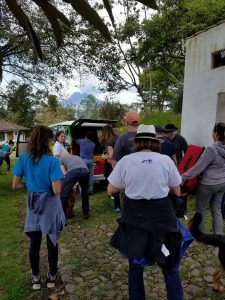 The group was fortunate enough to have had generous donations of drugs and supplies from such companies as Zoetis South America, Sentier, and Patterson Veterinary Supply. Sixty or more cases are seen each day. Each patient is examined by a veterinarian and then spay/neuter animals are premedicated with dexmedetomidine and hydromorphone IM followed by injections of Carprofen and Convenia. Cats are given kitty magic (Dexdomitor, ketamine and buprenorphine or hydro). Once sedate, the animals are transported upstairs to the induction room where, IV catheters are placed. Every patient is given Cerenia IV and then induced with ketamine IV. Higher risk patients are intubated while others are run on oxygen via a homemade mask. Four surgeries are performed simultaneously and each patient receives oxygen from one oxygen concentrator and one anesthesia machine graciously donated by Patterson Veterinary Supply. The machine is set-up as an ‘oxygen bar’ by piping oxygen from the fresh gas outlet and splicing it to feed four stations. Once on the table, patients are connected to a constant rate infusion of hydromorphone and ketamine to keep them anesthetized and analgesed during surgery. They are monitored using the Sentier Vetcorder pulse-ox and ECG as well as the Massimo EMMA end-tidal carbon dioxide monitor along with direct palpation of pulses, auscultation and mucous membrane color. Local anesthesia with bupivacaine or Nocita® is utilized for incisional and intra-testicular blocks. After surgery, patients are returned to the recovery area downstairs and monitored continuously until awake. Once alert with normal body temperature, every patient is vaccinated for rabies and other species specific vaccines (RCP, DHPP, Bordatella). All patients are dewormed and treated for external parasites. When they are alert enough to go home, they are reunited with their families most of whom wait all day at the facility.